How big is your wine collection? 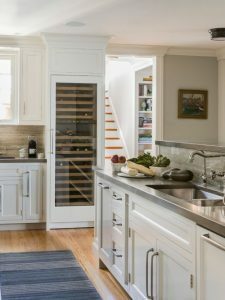 Wine refrigerators are a small obstacle for small collections up to 60 bottles, some units fit right in your kitchen cabinetry, just like a dishwasher would. But if you have over a hundred bottles, you may be limited by where you can place a wine refrigerator if you live in the crowded areas of New York like Manhattan. Size of the wine refrigerators may be your first concern. Your second concern, is where to place it to make it look seamlessly part of your home. The last thing you need is an eye-sore in the middle of the room. Many wine enthusiasts opt for placement of wine refrigerator units in the kitchen, but only if it’s space-permitting. If you’re interested in storing full cases of wine, wine refrigerators’ durability of the shelves should be your top priority. Even the most expensive units may lack the proper support for the added weight, not to mention the full dimensions of the case itself. 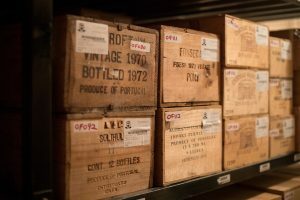 The other very important factor to consider is that storing full cases of wine may overload the delicate shelf-mechanics that allow for proper pulling out of the shelves themselves, and that may affect the opening of the main wine fridge door itself… and you definitely don’t want that to happen. So be sure not to overload your refrigerator’s wine racks. 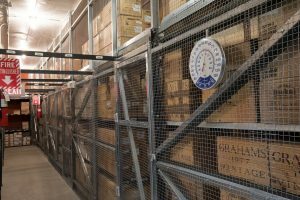 For wine collections over a few hundred bottles, unless you have a spare room or a dedicated wine cellar, off-site wine storage at a secure, flood-free wine warehouse is your best bet. At Mana Wine Storage, with options like Cave à Vin Privée and private wine lockers, we can fully customize a private space for your collection ideal to your specifications. The purpose of a wine refrigerator is one of the most common arguments among wine connoisseurs. In the best case scenario you will have a refrigerator for wine storage of your collection, and a wine cooler (or smaller – wine chiller) for your wines that you enjoy drinking daily at a specific temperature. In many cases, even dual-temperature wine refrigerators do not offer the ideal environment for both purposes. Does your wine refrigerator have backup power? Chances are that your home has access to electricity connected to the New York City grid. But who are we kidding. NYC electricity is not perfect. Power outages are very common. During summer peaks and storms you may be out of electricity for a few hours, a day or two. If you have the possibility of running a backup generator or have at your disposal solar power generators or potent battery cells that can run a wine refrigerator for a day or two, you may be in the clear. But if you don’t have the required commercial battery or outdoor space to run a solar generator, you run the risk of spoiling your wine collection. If you live in an area near a flood zone, no wine refrigerator will prevent flood water to ruin your wine collection, not to mention the wine cooler itself. It’s best to store your wine off-site at a flood-free wine storage facility like Mana Wine Storage in Jersey City. Have you considered cost of purchase, maintenance, and the electricity cost of running a wine cooler or wine refrigerator? Most collectors only think of the purchase cost of a wine refrigerator or wine cooler, but with the cost of maintenance and the amount of electricity the wine refrigerator uses, it could run into hundreds of dollars a year. The thermoelectric wine coolers are not as expensive to maintain but they’re not effective for storage of more than 20 wine bottles. What about the noise of a wine refrigerator? The less expensive the wine cooling unit, the more likely it is going to be louder. If you’re expecting to put it in a living area near the dining or living room, you will hear it. Together with other noise from your regular appliances, you might be turning up a few notches on your TV’s volume. Noise is one of the biggest complaints of owners of wine coolers. Opting in to thermoelectric wine coolers is another option, but more expensive. You would have the peace of mind that your favorite movie or conversation won’t be interrupted by the wine refrigerator’s compressor. Unfortunately, the thermoelectric units that can house more than 20-30 bottles are not powerful enough to cool down the bottles to the ideal temperature, especially if the air in your home is above normal. Simply put, they don’t have a compressor that can cool the air. Instead, the thermoelectric wine coolers rely on separating hot air from cooler air. 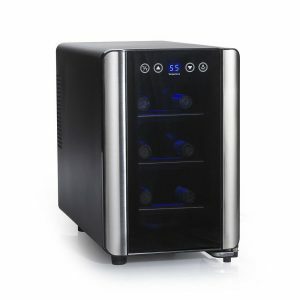 If you have more than 30 bottles, the option of thermoelectric wine cooler becomes a mute point. How the wine refrigerator fits seamlessly into your home is another concern. While built-in wine coolers can blend into your kitchen cabinetry or kitchen island, stand-alone units could throw-off the ambience of your living areas. Dual-zone wine refrigerators that house under 50 bottles are practically non-existent. The small wine cooler units are simply not large enough to separate the two zones. In fact, countless tests were run by manufacturers revealing that the temperature difference in smaller (under 50 bottles) dual-zone wine coolers is negligent. For the larger wine collections, (150-200 bottles) a dual zone wine refrigerator is a good idea, if you have the space for it. And remember, take into consideration backup power, electricity use, maintenance, flood-free zone, cost, noise and style. Order your favorite wine from your supplier and ship directly to Mana Wine Storage and we’ll throw in the first month of storage for Free. We offer daily deliveries throughout New York and New Jersey. Fill out the form and you can order your shipment as soon as we process your request. Your collection will be handled by our professional staff, stored in our climate-controlled facility, and delivered to your private residence or place of business upon request.